Skiing is an extremely popular winter sport, giving people of all ages an opportunity to spend time outdoors during snowy winter months. Skiing is a challenging sport that requires skilled coordination of the entire body and the ability to navigate difficult terrain. The practice of this sport can lead to the development of different injuries to the upper extremities as a result of the challenging level of this sport. 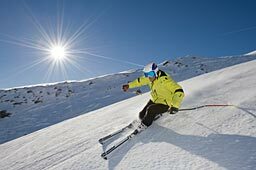 Skiing injuries can result from acute or repetitive strain or trauma, as well as from injuries linked to overuse. Most commonly, however, this sport is associated with a high incidence of acute injuries. A wide range of injuries can occur to people who ski. The upper limbs are the most commonly affected as skiers who fall or collide with other skiers or objects tend to try and use their arms to prevent injury. Skiers often place their arms out to break a fall and, as a result of this action, their hands, wrists, and elbows can be injured. Ski poles can damage the thumb, and fixed structures and other skiers and their equipment are also hazards to consider. A common injury is “skier’s thumb”. This injury can occur when a skier falls on an outstretched hand while still holding a ski pole. Skier’s Thumb is a result of a trauma levering the thumb away from the index finger. The injury can tear the Ulnar Collateral Ligament at the base on the thumb. A partial tear may only feel tender, but a full tear is more swollen and painful. All grades of injury require evaluation and treatment to optimize healing. One of the most common upper extremity skiing injuries is a thumb ligament tear. The UCL is the most commonly injured as a result of skiing accidents. This injury typically occurs when a skier falls and doesn’t release their ski pole. This causes the pole to deflect the thumb and damage the ligamentous and bony structures. Acute injuries are the most common injuries in this sport. The initial management includes the RICE method: ice, immobilization, compression, and rest. A partial tear can be treated with conservative management, like immobilization in a splint or cast. However, the majority of complete tears need to be repaired surgically. Surgical treatment is usually reserved for cases where a skier has a complete rupture of a tendon or ligament, and sometimes after a fracture of a phalanx or metacarpal. Please contact us as soon as possible to schedule an appointment with our talented team. People who have been hurt while skiing should be evaluated to try and prevent further injury and mobility issues. If you have been injured, it’s important to be evaluated by a highly skilled hand surgeon. Call Drs. Mark and Jason Pruzansky at 212-249-8700 to schedule an appointment and obtain an accurate diagnosis.